Return to the Endless Pools page. CALL DEEP-SIX FOR MORE FREE INFORMATION OR FOR INSTALLATION INFORMATION. 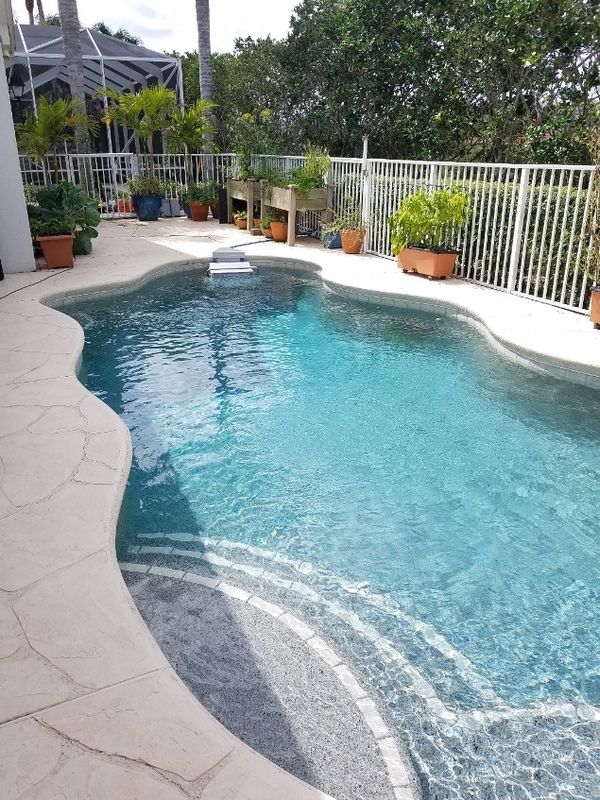 The average home pool is a great place to cool off, splash around and socialize, but it is not for swimming and exercise - six or eight strokes brings you to the end where you have to turn and start over. They are just too small to allow comfortable life-extending exercise. The FastLane is a swim current generator for your existing swimming pool that allows you to swim for miles without moving an inch. It is easily installed in virtually any pool. The FastLane creates a smooth current that is wider than your body and deeper than your stroke. It is ideal for swimming, aquatic exercise and rehabilitation. The FastLane makes exercise easy and fitness fun. 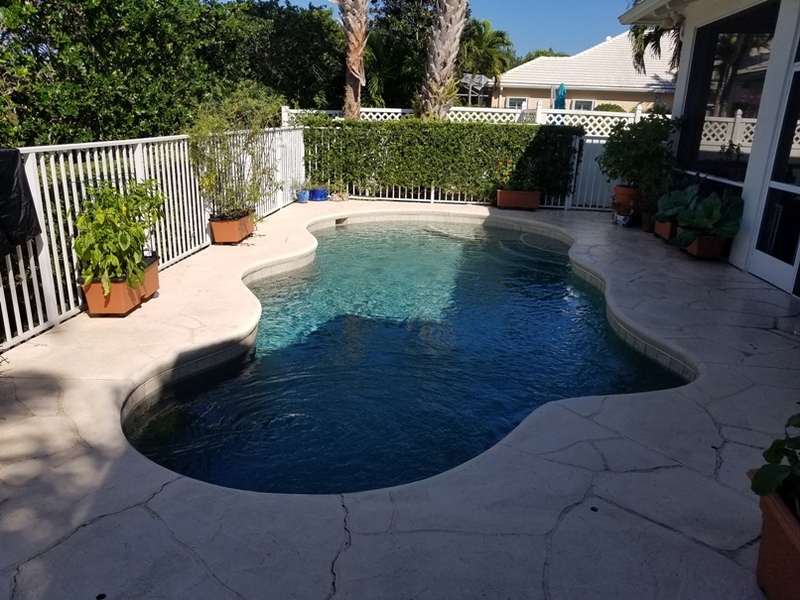 To take advantage of this exciting product your pool must be at least 3' deep, 12" on each side of the FastLane, and have at least 12 feet behind it. The following pictures show a typical FastLane installation which takes about 3 days. They will show the ease of installation and the lack of major pool changes. This pool is not designed for life-extending swimming exercise. It is too small, too shallow, and too narrow. By adding a Fastlane it makes the pool into a swimming machine. The current is adjustable from extremely slow to one that would challenge a marathon swimmer or swim team trainer. What a treat to be able to swim in your own clean pool, by yourself, when you want to,with no travel time, and for no pool fees. Installation is complete and, if necessary, the unit could easily be moved. There is no electricity going into the pool. The current is produced by hydraulic fluid and the speed of that fluid entering the hydraulic motor. The Power Unit above sends the hydraulic fluid to the motor. 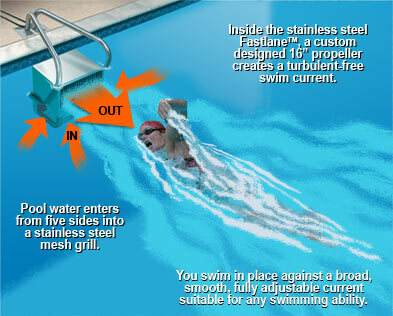 The unique FastLane system produces a non-turbulent current that can be set to a speed to suit any swimming or exercise ability. Anyone can learn to use the FastLane in moments regardless of age or fitness level. The FastLane's highest speed challenges the best competitive swimmer, yet the current can easily be adjusted to suit the beginner and everyone in between. The FastLane hangs from the top or side of the pool much as a pool ladder does. It can be incorporated into virtually any swimming pool. The system has two parts: A remotely located hydraulic Power Unit that powers the swim current inside the FastLane Swim Unit. These components are connected by two 3/4" diameter hydraulic hoses designed to keep electricity far away from the water. The poolside FastLane Swim Unit includes a waterproof hydraulic motor that turns a custom-designed 16" propeller and an innovative channeling system that straightens and smoothes the swim current. The low-profile connector that suspends the Fastlane in the pool carries the hydraulic hoses over the pool coping and to the motor. At the bottom of the FastLane water enters from all directions, including the back, through fine-mesh stainless steel intake grills. 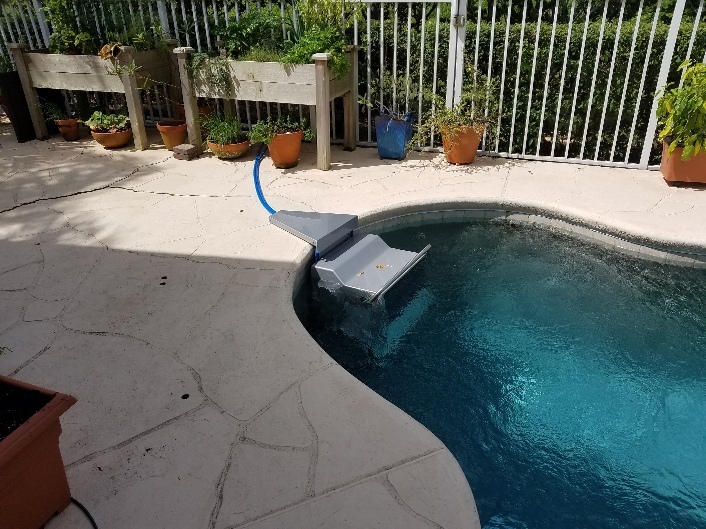 Unlike a hot tub or pool with a narrow 2" diameter intake, the Fastlane's intake is 687 square inches in area (nearly five square feet), eliminating all worries about suction danger. The rugged 5 horsepower Power Unit can be located up to 200' from the pool, optimally with your other pool equipment. We offer a weather guarding hood should it be placed outside. The FastLane comes with 5 gallons of biodegradable vegetable oil to supply the Power Unit system. Learning to use a FastLane takes only seconds. Turn the FastLane on by pressing the On button on your remote control. Swim into the current. This will demonstrate how much room you have to swim in and how the current's power increases as you approach the Fastlane Swim Unit. When changing speed with the Up and Down buttons on your remote control to set it a comfortable level for your needs. Remember, since you're not turning, you will tire slightly faster than when swimming laps. To stop swimming, simply swim out of the current. Press the Off button on your remote control to turn off the Power Unit. It will slow down and then shut off completely. Restart if you wish by pressing the On button. The FastLane will return to your last speed. For safety the FastLane has a built-in safety timer that shuts the current off after 30 minutes. Few fitness activities rival swimming for cardiovascular and musculoskeletal benefits. Swimming works more muscle groups simultaneously than almost any other form of exercise. Swimming also burns as many calories as other aerobic sports without the associated dangers to muscles, bones, ligaments and joints due to stress and constant pounding. no more flip turns. It is ideal for everything from stroke drills to endurance training to a refreshing summer swim. The FastLane will revolutionize swim coaching. Since athletes swim in place, coaches can offer instant stroke feedback - swimmers no longer have to finish a full lap before hearing their coach's corrections. Swimming in place allows athletes to concentrate on their stroke mechanics without the interruption of flip turns. The flow of the Fastlane's smooth current over a swimmer's body highlights stroke deficiencies. The underwater camera allows coaches to closely evaluate the underwater portion of a swimmer's stroke. The underwater mirrors reinforce the coach's instructions by allowing swimmers to see their stroke. Mirrors can be placed in various locations so swimmers can see both their hands and feet. The Fastlane can be easily installed in most diving wells without affecting normal practices. Alternatively, the Fastlane can be installed in a regular training pool & removed when necessary. For those suffering from arthritis, fibromyalgia, MS, osteoporosis and orthopedic injuries, water therapy has become an essential part of building strength and range of motion while minimizing pain. Since the water supports an individual's weight, it is possible to strengthen and tone muscles without putting stress on joints. In addition, water therapy helps decrease swelling and increase circulation, endurance, flexibility, range of motion, balance and coordination. The adjustable current allows changes in resistance as individuals become stronger. The Fastlane adds a whole new dimension of fun to your pool. Not limited to swimming in place, the Fastlane is perfect for many activities - the possibilities are limited only by your imagination. Is your backyard pool long enough to train in? We didn't think so. The Fastlane simulates an open water swim much better than laps in a traditional pool. By eliminating turns you get a better understanding of your true open water endurance. What's more, by adding a Fastlane to your pool, you'll have the resources to do an entire triathlon in your neighborhood-you can even practice transitions at home! The standard Fastlane has a top speed equivalent to a 52-minute Ironman pace. Our optional Hi-Performance current reduces that time to 43 minutes. So unless you plan on breaking the record at Kona, you'll have more than enough horsepower.